This season’s Doctor Who premiere had, at its core, a very compelling, tried and true sci-fi idea: The Doctor realizes that by abandoning a young boy to certain death, he created Davros, creator of the genocidal Daleks. In order to stop Davros, the villain, the Doctor has to go back in time and save Davros, the boy. So the Master is freezing planes in mid-air in present day England and so Clara Oswald leaves school to go to UNIT and then finds the Master, and the Master says she and the Doctor are actually friends but the Doctor is going to die, and so then they travel back to medieval times where the doctor is facing down a knight with a tank and a guitar, but at the same time Davros’s messenger is trying to find the Doctor and going through all these planets and places like the Maldovarium and the Shadow Proclamation, and then the messenger finally finds the Doctor in medieval times and tells them Davros is dying, and then they go to what they think is a spaceship but is actually an invisible planet named Skaro and the Daleks kill Clara, and the knight turns out to be a Dalek in disguise and the Dalek’s destroy the Master and the TARDIS, and the Doctor travels back in time to save the Davros as a boy, who he’d previously abandoned. Now, there are much more coherent recaps than the one delivered by my hypothetical 7-year-old. But the point remains that to someone who’s never seen Doctor Who before, the episode would be completely unintelligible. To someone who’s seen every episode of Doctor Who since 2005, the result is basically unintelligible. And Saturday’s episode was just part one of two! Who knows what nonsense will come next week? At its best, this sort of chaos can work for Doctor Who the same way a roller-coaster does. The story zips from one idea to another, plunging us into a complicated world, then moving to the next just when we get a sense of it. Trying to follow along can be exhilarating. No need for plodding explanation or rumination. Just get to the technobabbling and sonic-screwdriver waving and corridor-running. 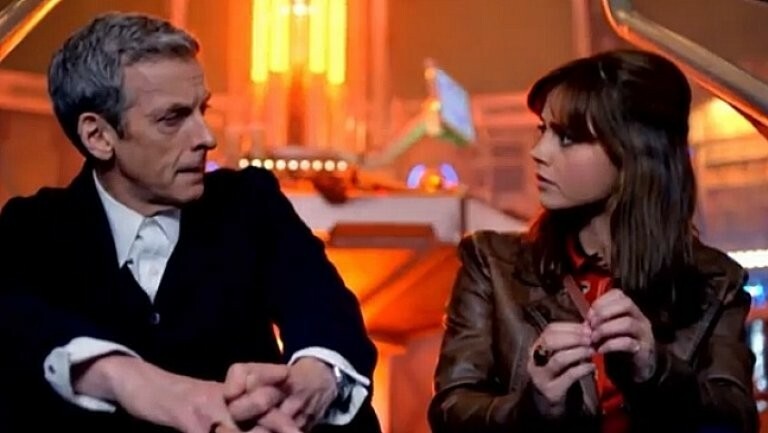 But Moffat’s worst episodes look more like a brainstorming board — there are no bad ideas, folks, keep ‘em coming! — than a coherent plot. He grew up as a Doctor Who fan, long before he was the Doctor Who showrunner. The problem with making the idea-man the boss is that you can get too many ideas. Nobody’s there to play the party pooper who plucks out all the excess chaff from the script. Worse, you see wonderful ideas, ideas that could power entire episodes, popped like party favors — providing noise and a bit of confetti, but signifying nothing. An invisible planet? That’s a good idea! The Doctor traveling back in time and competing in a knight’s tournament using modern technology? That’s a good idea! The Master freezing planes in mid air as a plot to trap the Doctor, his nemesis? Another good idea! Maybe he could write an episode focusing on one of those ideas. But all these ideas, flung against the wall, don’t add up to a sum as much as a chaotic flurry of parts. He has the tendency to cram his scripts full of nods, cameos and obscure references to the 34 previous seasons of the series. I’m sure it delights the sort of fan who was knitting Tom Baker scarves 20 years ago, but it's bound to confound and irritate the casual viewer. Kill your darlings, the old editor’s cliche goes. Thankfully, that doesn’t mean everything you love has to be cut. Rather, the advice is to not get so attached to your witty turn of phrase, your fantastical concepts, your zany new character, that you’re willing to let the work sink under its ungainly weight. All else must be sacrificed for the greater good of the story. It needs to flow. It needs to cohere. It needs to make sense. And at times, especially when Russell T. Davies still ran the show, Moffat seemed to get that. His best episodes — “Blink,” “Silence in the Library” — established three or four concepts and focused on them exclusively. There are creatures that look like stone sculptures — that only move when no one is looking at them — that will send you back in time if they touch you. A library infested by microscopic swarms of monsters that disguise themselves as shadows. There are other concepts he explored within this framework, about computers rescuing consciousness and about “timey-wimey” trickery. But he gave the audience time to soak in these ideas, and clearly confined them to the scenery or subplots. Moffat can excel at telling complicated “puzzle” stories that rely on paradoxes, time travel, and solving mysteries. What’s a problem is when he throws a bunch of other pieces in the box that look strange and pretty, but don’t remotely fit the larger puzzle.